Have you ever thought about building your own pond? Outdoor water features attract wildlife such as birds, butterflies, dragonflies, frogs even Deer. Surprisingly affordable and easy to create, many find them soothing, peaceful, relaxing and quite enjoyable. Following this tutorial, you could build your very own this weekend. 1. Dig a hole, first! Dig it a minimum of 12" deep overall, with a deep end of about 24". If you live in an area subject to freezing temperatures, dig your deep end deeper than the frost line. Otherwise, your fish will surely freeze to death. Be sure to taper the edges to smooth the transition and minimize wrinkles. The size and depth of your pond should never exceed the dimensions of your EPDM pond liner. Be sure to remove any sharp objects, which could penetrate your pond liner, such as rocks and tree roots. A 2-3 inch layer of sand under the liner will prevent frost from heaving rocks up which could damage it. Dampen the sand with a garden hose to help hold it in place. 2. Start filling the pond, once you have the liner in place. As the water level rises pull gently on the liner to assist in removing wrinkles. You want the liner smooth as possible, without being pulled drum-head tight. Wrinkles create places difficult to reach and clean and will encourage Algae to grow. 3. Secure the liner in a manner which will allow for expansion and contraction, otherwise, it may tear. Never stake it in place! Lay back the sod around the perimeter of the pond and tuck the edges of the liner underneath. Or, use the edges of the liner as a grass & weed control barrier and cover it with decorative stone. 4. Submerge the pump/filter unit into the deep end, once the pond has filled, and adjust the discharge tube so that it sprays above water for maximum aeration. Attach the 1/2" tubing to the diverter valve and run it out to the perimeter. You can attach this to a decorative 'spitter.' For another attractive option, wedge it securely in place and allow the water to spill over a well-placed stack of flat rocks angled as a waterfall into the pond. 5. Add your fish pond supplies! For aquatic plants, Jumbo Water Hyacinth make excellent oxygenators! In fact many Water Treatment facilities use them in their pre-filtration ponds. 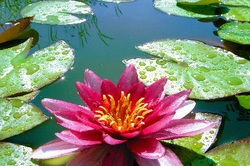 Water Lilies and Lotus add variation and provide protective cover for pond life such as Fish & Frogs. Floating aquatic plants also provide shade which helps to keep the water temperature in a comfortable range. Submerged plants will need weighted pots to keep them in place. For stability, transplant them into larger pots of the same material they came in. Add a healthy amount of Pea Gravel as weight. 6. Add life to your Pond! Japanese Koi & Black Japanese Trapdoor Snails make great choices! The snails are beneficial for Algae control. In place of, or in conjunction with, add a few Algae Eaters or Plecostomus. Control Algae to preserve oxygenation and clear water. Add a couple Bullfrogs to complete the pond. * If you live in an exceedingly hot climate, and are short on shade, cover the black pond liner with river rocks and pea gravel. They are smooth and rounded, and their lighter coloration reflects the sunlight to keep the water cool and refreshing. This also helps to reduce evaporation. * If you add Painted Turtles, be sure to provide a stack of rocks for them to climb up on. They will drown, if they are unable to get out of the water to rest and sun themselves. * You can operate low voltage pumps with a Solar panel, in areas remote from an electrical source. * For pond lighting, consider some well placed solar walkway lights to identify the perimeter in the dark. * Without adequate filtration, circulation and aeration, pond water will quickly stagnate and become a breeding ground for Mosquitoes! * Watch out for Blue Herons. They can fish a pond clean in no time! * Follow the same Laws and Regulations for in-ground swimming pools, with regards to child safety fencing. * Be sure that your 120V, 20A, electrical outlet is GFCI protected!